In UGO!, players try to found a mighty kingdom. Eagerly they expand their empire with more and more countries - but only the areas that are well maintained by farmers shall ensure that a truly flourishing kingdom will be founded. 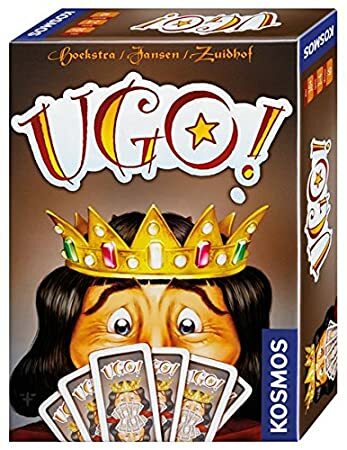 UGO! 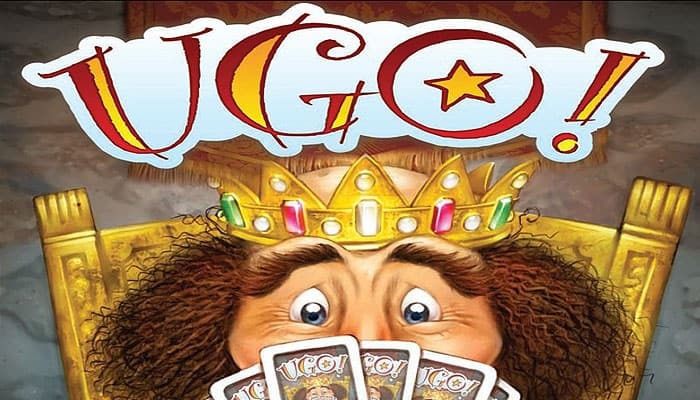 is a trick-taking game. The starting player plays a card from hand, then in clockwise order the other players play a card of the same color, if possible, while playing a different color otherwise. The one who plays the highest card takes all the others. In a tie, the player who follows suit wins. If none of the players followed suit, then the first one wins. The winner places the cards on his kingdom cards, starting from left to right and sorted by color. If you have nothing on your kingdom cards yet, you can sort the cards from left to right in any order. However, if you do have cards already on your kingdom, you must place them on top of the other matching colors (countries). As soon as you have placed the cards and started a new game round, you may not change them anymore. The winner of the game round is also the starting player of the next one. Players try to found a powerful kingdom. They hungrily expand their domains by taking more and more countries, but only those that are well maintained by farmers ensure the founding of a truly flourishing kingdom. After playing 4 games, the player with the highest number of points wins.